Shoulder pain is the third most common complaint we treat. Though the pain is felt in the shoulder girdle region, more times than not, the cause is not of the shoulder itself, or there’s a secondary contributor to the problem! The pain we feel — whether in the neck, the shoulder(s), or down the arm(s) — is the body’s request for change, not an indication something is broken, needing to be “fixed.” By taking the time to understand the problem and how it behaves, we can apply the right tool for the job — only then can we achieve a solution. Shoulder pain is most commonly of mechanical nature, e.g., movement, postures, body mechanics. If your shoulder pain changes — for better or worse — with varying movements and positions accompanied by stiffness or loss of range of motion, you likely are suffering from mechanical pain. The question is: is it truly a shoulder problem or is pain coming from a remote location? Acute shoulder pain is an episode lasting no longer than six weeks, which is more common than chronic shoulder pain lasting longer than three months. Because the nerve supply to your shoulders and arms stem from the spinal cord within the spinal column, suboptimal cervical spine (neck) mechanics can alter the signals from your brain to the shoulder muscles via nerve pathways. It is not uncommon to experience shoulder symptoms when the neck is the source; in fact, we find it’s the case more times than not! To be crystal clear, we do not correct tears and arthritis. Above are standard labels tagged on patients, which we have successfully treated, regardless of the diagnosis — call it “misdiagnosis” if you will. The problem with these diagnoses is they simply tell you what it is, not how or why it occurred, nor how to correct it. Furthermore, there’s no standard of diagnosis among professionals. In rare cases, shoulder pain can indicate a serious medical problem — such as a heart attack — requiring immediate attention. If you suffered direct trauma to the shoulder, or experience dizziness, double vision, difficulty speaking/swallowing, direct trauma, or unexplained weight loss accompanied by shoulder pain, seek immediate medical attention. The pain we feel is simply a request from our brain to change. Pain is often not associated with damage, rather a very apparent alert we need to change our physical behavior or else physical impairment will proceed. Mechanical shoulder pain does not have to be debilitating. Just because you have shoulder pain doesn’t mean you need an MRI. Just Because your MRI shows “tearing,” “degeneration,” or “arthritis,” doesn’t mean it’s generating your pain. And just because you have shoulder pain does not mean you’re broken, needing to be “fixed.” Even if you have a full-thickness rotator cuff tear found on imaging, e.g., X-ray, CT scan, MRI, you’re twice as likely to not have pain as a result of the tearing. The medical literature is concluding most degeneration and arthritis shouldn’t be scary — it’s nothing more than “gray hair” and “wrinkles” on the inside, similarly as it occurs on the outside. Furthermore, there’s a high prevalence of interpretive errors between radiologists. So, not only does imaging your shoulder result in a high rate of irrelevant findings, the professionals interpreting them cannot concisely agree upon diagnoses! In some cases, surgical intervention may be necessary. A baseball pitcher will stress the shoulder to its limits, whereas the corporate athlete won’t regularly endure wind-and-grind to quite that level. 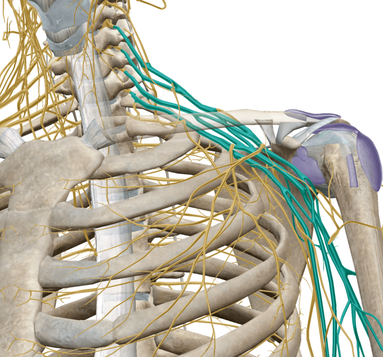 Highlighted in blue are nerves supplying arm muscles commonly affected by a shoulder or neck problem. Your rotator cuff could be “degenerative” and “partial tearing” regardless of whether or not you have pain. If you’re over fifty years old, it would be abnormal not to have degeneration! To learn more about the problems of MRI regarding muscle and joint pain, click here to read our evidence-based blog post on the topic. 17 different muscles attach to the shoulder blade, while the only bony connection is the clavicle to the sternum (blue). Mechanical shoulder pain is most commonly caused by faulty body mechanics, repetitive use without appropriate rest, and poor postural habits. As previously mentioned, most shoulder pain has a cervical spine (neck) component as a source, whether primary or secondary. Humans are meant to move and move often — not sit in chairs and stare at electronic screens for hours on end. From infancy through the first year of life, we learn to how to move, setting us up for the rest of our lives. Mechanical shoulder pain can occur suddenly from a particular incident, or can gradually over time for no apparent reason. The pain can occur from rigorous use during sport, or as simple as lifting holiday decorations box overhead to the top shelf. Pain from sport or reaching overhead is not because the activity is inherently dangerous, rather accumulated stress results in such an imbalance the brain sends pain as a request for change. Otherwise, a serious structural problem may occur if continuing to ignore the signal. The shoulder, especially, needs efficient body mechanics as it relies primarily on its supportive musculature for function. The shoulder joint is a very shallow ball-and-socket — like a golf ball on a tee — and the only bony connection to the torso is where the collarbone (clavicle) meets the chest (sternum)! For various reasons, we have upper trapezius dominance: the propensity to hike the shoulders up toward our ears when utilizing horizontal and vertical push/pull functions. Shoulder hiking is extremely inefficient where accumulative stress causing mechanical neck and shoulder pain is one of the most common causes. What is upper trapezius dominance? Blue and white lines of the trapezius work in unison with other shoulder stabilization muscles to anchor the shoulder blade into the thorax. Overutilization of the blue lines, pulling green to red, uses the neck as an anchor for the shoulder to pull from — a common cause of neck pain. Overutilization of the blue lines, pulling green to gold, is hiking of the shoulder which is a common cause of shoulder impingement. Pain in the area of the blue lines is often described as shoulder pain, but its origin is from the neck. The cause is flawed mechanics. Overuse of a specific function, like a baseball pitcher throwing or a painter painting a ceiling, will cause fatigue of supportive musculature increasing the risk of an imbalance or injury resulting in mechanical pain. Think about the average desk worker’s day: sit for breakfast, sit in the car to work, sit at the desk, sit for lunch, back to sitting at the desk, sit in the car back home, sit in front of the T.V. — you get the point. Sitting promotes a forward posture, creating an imbalance in the neck and shoulders which is commonly a cause of mechanical pain. The most common treatments are rest, medication, physical therapy, chiropractic, acupuncture, massage, passive modalities, e.g., ultrasound, laser, and other various conservative therapies. Furthermore, it’s difficult to demonstrate if positive outcomes from treatments mentioned above are the result of the therapy itself or simply time. While most acute bouts of shoulder pain will resolve on its own within a few weeks, the risk of recurrence is very high as influencing behaviors and habits are often ignored. The greatest risk for injury is the previous injury — if you’ve done it once, it’s very likely to happen again. Though conventionally accepted, few individuals need surgery for shoulder pain. 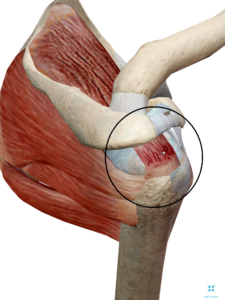 Have a SLAP (Superior Labrum Anterior-to-Posterior) tear? Be careful: a positive outcome from surgery of repairing the labrum may be nothing more than an invasive and expensive placebo. If you have intense and unrelenting radiating pain down the arm with progressive muscle weakness, unable to lift and hold the arm above shoulder level without pain, or specific structural problems not responding to conservative therapy, surgery may be warranted. STILL STRUGGLING WITH SHOULDER PAIN? WE CAN HELP! Our approach isn’t to just “fix” the problem, rather understand what it is and what it isn’t, so the correct treatment is applied to the right problem — only then can we achieve a solution. Why use a hammer if you’re not positive it’s a nail? The last thing you want is to hammer away at a screw! 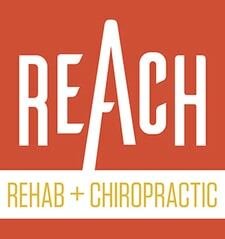 REACH initiates treatment for shoulder pain by utilizing the Mckenzie Method (MDT). MDT is a proven system of examination, treatment, and classification of spinal, joint, and other musculoskeletal pain, backed by years of research, evidence, and practice. The System has been shown to be low cost, fast, and effective even for chronic pain. By exploring simple movements in repetition that improve or worsen your symptoms and functional baselines (e.g., walking, stepping, lifting, reaching, bending, muscle strength), we can understand how your pain behaves. If a mechanical force caused the problem, then it is logical that a mechanical force may be part of the solution. The MDT system is designed to identify the mechanical problem and develop a plan to correct or improve the mechanics, thus decrease or eliminate the pain and functional problems. Further, the system tells us what treatment tool to use at the appropriate time, eliminating the guessing game. Once we identify a movement(s) which improves your baselines, you’re on your way to controlling your pain yourself, not needing your chiropractor on a repetitive basis. If your problem is something we are unable to treat, the McKenzie assessment will tell us this within the first few visits, and then we recommend the next best course of action to find you a solution.